Felix holds a PhD in Environment and development. He investigated Forest ecosystem services, Carbon stores and rural livelihoods in Zambia’s Miombo woodland systems. 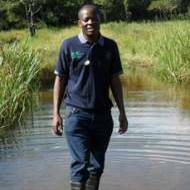 Further, he holds a BSc in Forestry from Copperbelt University and an MSc in forestry from Stellenbosch University. He begun his career working as a natural resources economist for WWF Southern African Regional Program before joining the Copperbelt University in 2005. Felix has worked on several projects linking forestry, agroforestry and rural livelihood, and conducted various vegetation and social-economic surveys. He is an advocate of interdisciplinary research, owing to the fact that the problems that the environment and people face are multi-dimensional. Carbon stores and dynamics in woodlands. A conceptual framework for understanding Forest-Socio-ecologicalsystems.